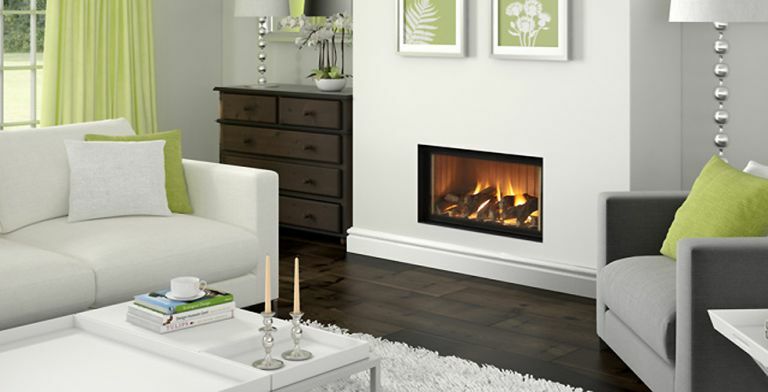 Selecting a fire and fireplace for your own living space is as personal a choice as any within the household. There are no hard and fast rules but first ideas will normally focus around the wider décor scheme being applied to the property, and can span from a very clean neutral look, to a very characterful period re-creation. The choice of fire or stove model itself is often guided by the fuel choice and that is definitely one factor to consider early on, thereby allowing for accurate budgeting of the total scheme. Natural gas (mains gas) is still normally the most convenient and cost effective choice. Oil is not a fuel used for UK fireplace heating appliances generally speaking, and so off gas-grid choices naturally focus on wood/solid fuel, electric power or bottled gas (LPG Propane). If there is a chimney or flue already in place, then it is generally easy to choose wood/solid fuel or gas appliances as the heat source – they give the best visual flame appearance possible. Gas fires, either natural gas or LPG can use their own flue pipe (balanced flue – similar to a gas boiler) where there is no chimney and so give the superb look of a real flame fire, where there is no useable or functional chimney in place already. Electric powered appliances don’t require a flue or chimney but some versions other than freestanding stove or hang-on-the-wall styles will require some depth behind the fascia panel to give an inset look. Electric fireplace suites can give a very quick and easy finished job with pre-arranged space for the electric fire, within a bespoke single fireplace package. Electric limestone fireplace packages are available as a mid-high end alternative, with very attractive ambient flame effects. The choice of fireplaces and stoves available is as wide as it has even been, ranging from the strictly traditional to ultra-modern aesthetic. Current trends for fireplace surround materials focus around stone product such as micro marble, which is a reconstituted version of the ever-popular natural marble. Being man-made it is useful for its unchanging consistency of finish and is suitable for the majority of gas fire installations, but does not offer full heat tolerance for some wood/solid fuel installations. Limestone is probably the second most popular material for the UK fire surround market. Premium UK sourced limestones provide a more rustic, often fossil textured finish whereas generally more cost effective Portuguese sourced limestone gives a smoother, more uniform texture and commonly more subtle layered colour hues. Wood is always available for fireplace surrounds in its plethora of colour finishes and grains, and other materials such as granite are a very practical option. Stoves are perhaps less affected by fashion trends, but the overwhelming factor influencing current choice is the view of the fire afforded by the glass panels of the stove. Whilst it is possible to buy second hand traditional stoves, the progress made on combustion efficiency and cleanliness of the burn means that it is always best to go for a brand new version if available. Stoves that suit every taste are available, from the old UK style “black box” to much more exciting flame pictures and cleaner burning performance available from current designs. Having an attractive fire and fireplace within the living space is always an asset to the home. During modernist phases of interior design, fireplaces were sometimes lost from the room space and even in this situation modern freestanding wood/solid fuel, gas or electric stoves can provide a renewed focus of heat and ambience. A fireplace and chimney can often be added to a property whether an outside wall is available or not. Wood log burning appliances provide the most dramatic flame pictures and high heat outputs, but have a cyclic burn and output. They also require skill in lighting the fire and operating. They also need high specification flues and chimneys, and daily to weekly cleaning and maintenance, together with space for fuel storage and even log processing. On the other hand gas appliances are usually piped into the economically priced grid supply, require only an annual service and utilize lower cost flues and liners to provide 90% of the flame effect, with huge convenience of remote control and automatic ignition. Electric fires arguably have the lesser flame picture but are supremely practical in their ability to be sited almost anywhere and in a variety of cases greatly reduce the costs of a professional installation. There is a myriad of finishes on the market from traditional wood and stone with matt black appliances to bespoke fireplaces that can be commissioned from almost any practical material. Smooth and neutral coloured marble and limestone fireplace finishes are the most popular over all, but can be mixed with black granite or travertine, for example, to give contrasting details. Traditional styles such as cast iron fireplaces for period properties are not just products that can be found in the reclamation yard, many manufacturers can offer a modern reproduction that accommodates a high efficiency gas fire or stove. Although for stoves matt black and graphite grey are the overwhelmingly most popular finishes, they are available from some manufacturers in a range of colours and heat resistant spray coatings can often be used to bespoke a particular product to your taste if required. Stoves and fires can be fully inset into a wall, fireplace or chimney breast or freestanding on a hearth or within a chamber in the wall or chimney breast. Fires and fireplaces are professional fit products and safety must not be compromised when securing stone surrounds, or connecting and testing gas or solid fuel appliances. Obtain quotes and opinions from more than one installer as professional experience and practices can vary considerably. Many electric fires or timber based electric fireplace suites are DIY installable as connection to the power supply is provided by 13 amp plug. To prevent unforeseen accidents care must be taken that any fireplace fixings are properly fitted and checked professionally if required. As discussed earlier, the most popular current materials and finishes are the more neutral colours and smooth finishes, particularly in reconstituted and natural stone. A changing theme is the style of fireplace design, which has been based on very simple ‘block’ shapes in the recent past and is now moving into more sophisticated profiled shapes and contours, which add more interest and character to the fireplace. Detail work such as carved corbels and dentil edging are all but absent from mainstream stone fireplace design at the moment. Freestanding stoves placed back into the fireplace chamber are as popular as ever, having always been stronger than the neater inset design in their popularity over recent years. Wood burning stoves are still a very popular option for the practical householder prepared to invest the time and effort into them. Gas fires have improved hugely in their visual effect and the trend is moving to the larger built-in gas fire, often in a stone or marble fireplace suite, over smaller more traditional styles. Remote control is now rapidly becoming the default control type for gas fires. Gas stoves are an option gaining traction where the practicality of gas fuel, integral ignition and instant control are invaluable. Whatever the final choice, a well selected fire or stove and fireplace combination will enhance the living space of a home and add value to the property, as well as providing lasting warmth and pleasure.